I finally got my commission finished of the "black" horse of a different color! As you can see she's got a lot of red to her coat which did not make her a truly black horse. This painting was both a pleasure and a challenge to do mostly because of her color which changed in different lighting and at different times of the year and I had reference photos taken from many different times. So....after about three attempts with watermedia I finally switched to colored pencil and the piece started to come together. There is a lot of subtle shading with many different pencils to achieve the coat color and the sheen. There not only was the red, but in the shadow areas I could see shades of purple as well. A very colorful black horse, indeed! I delivered her to my clients last night and they were thrilled. 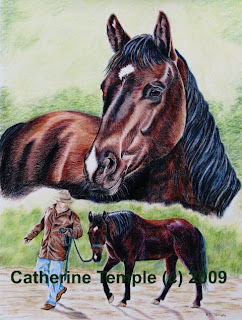 Thank you Dale and Linda for trusting me with another painting of your treasured pets! I currently have one more commission to complete. 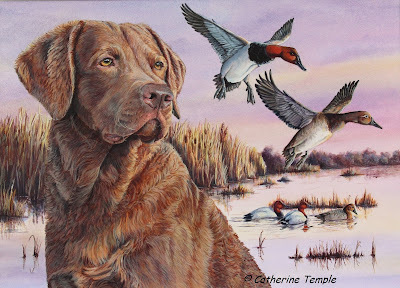 The next one is a black and white pencil portrait of four Chesapeake Bay Retrievers. I am really looking forward to starting it as this piece features my favorite breed of dog. It's a bonus that I have also met each one of these wonderful canines in person and was able to photograph them myself. Also, this piece will be a nice change of pace as I will not have to worry about color and will be able to focus on drawing the coat patterns and detail. After this last commission is complete I will be taking a little break from pet portraits or at least not actively pursuing commissioned pieces (though if any come my way I certainly will not turn them down!!!). I am not planning on doing any other shows this summer. What I will be doing is taking a little time to dream, plan, and decide what direction my art work needs to take. The pet portraits have been a most wonderful journey and I will continue to do them, but I believe there is much more in me and I need to explore what that might be. I hope, in the coming weeks, to play with new mediums as well as new subject matter. Keep watching my blog to see what develops!